Greg MacGillivray is a giant-screen documentary filmmaker who has produced and directed some of the most successful films in the IMAX® film format, including the box-office hit “Everest” and the Academy Award®-nominated films “The Living Sea” and “Dolphins.” With 40 giant-screen IMAX/IMAX 3D films to his credit, MacGillivray has shot more 70mm film than anyone in cinema history—more than two million feet. He is the first documentary filmmaker to reach the $1 billion benchmark in worldwide ticket sales. 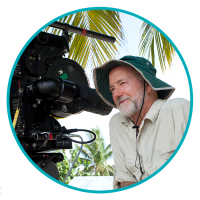 An ardent ocean conservationist, MacGillivray and his wife Barbara founded the One World One Ocean Foundation, a non-profit public charity devoted to science education through giant-screen films and companion programming. The Foundation’s first initiative is the One World One Ocean campaign, MacGillivray’s most ambitious project yet: a sustained, multi-platform ocean media campaign aimed at changing the way people see and value the ocean. The campaign includes IMAX films, a television series, and a series of original Online programming—all to be released in collaboration with MacGillivray Freeman Films over the next five years, including TO THE ARCTIC (Polar Bear habitat change), JOURNEY TO THE SOUTH PACIFIC (how Marine Protected Areas succeed), HUMPBACK WHALES (comeback of the whales), NATIONAL PARKS ADVENTURE (conservation of Natural Wonders), and OCEAN PLANET (studying the ocean from space).